Our first “Pass the Energy Please” post introduced ATP as the fuel for our muscles and the three energy systems in our body that produce it. Remember the graph from the first post? This post will concentrate on the ATP-PC Energy System (in purple). Short duration, High power. The ATP-PC system is immediate and functions without oxygen. It allows for up to approximately 10-15 seconds (+ or -) of maximum effort. In order to improve our ATP-PC system doing less produces the best results. 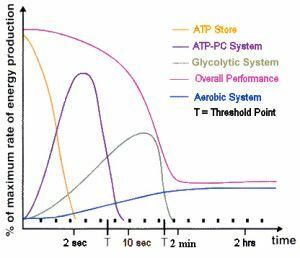 The ATP-PC system is an anaerobic alactic system. “Anaerobic” means it does not require oxygen and the “alactic” component means it does not result in the accumulation of lactic acid. Anaerobic alactic conditioning is mainly used to increase maximal strength, speed, and/or power. It is called upon when your heart and lungs cannot keep up with the energy demands. The anaerobic alactic energy system (ATP-PC) provides massive bursts of energy in very short periods of time. Generally speaking, the anaerobic alactic energy system can only be dominant for, at most, 10-15 seconds. 2. Capacity – which lasts up to 15 seconds. Anaerobic-alactic conditioning circuits can be performed 1-2 sessions per week for 2-6 weeks at a time. Once that time frame is over, switch to anaerobic lactic and/or aerobic-based conditioning. The whole point of anaerobic-alactic conditioning is to go as hard as humanly possible. If you aren’t going as hard as you can then you aren’t doing it right. 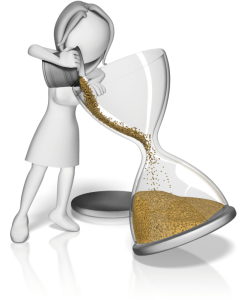 Work periods should last between 8-20 seconds depending on your goal. If you want more power-based work then stay on the lower end of the time spectrum. Whereas if you want more capacity-based work (i.e. the system lasts longer) stick to the higher end. Rest periods, on other hand, should remain between 90-120 seconds. Ideally you’d wait until your heart rate returns to roughly 120 beats per minute (BPM) but, if you don’t have a heart rate monitor just stick to timed rest periods. Generally speaking, anywhere between 8-12 sets is sufficient to see the best results from anaerobic-alactic conditioning. Pretty much any exercise will work so long as you’re working as hard as humanly possible. The images below show some of the exercises you could do. If you want to use anaerobic-alactic conditioning in your dragon boat training, the following drills will work. Total Rounds: Repeat circuit 4 times then swap sides and repeat 4 more times. Warm up properly. Whole boat paddle for 20 strokes to get the boat moving. 1. Seat one paddles as hard as humanly possible for 10 strokes. Then rests. 2. Seat two paddles as hard as humanly possible for 10 strokes. Then rests. 3. Work through the boat. If the numbers at training are small (i.e.10-15), get paddlers to paddle individually. The 90 second rest is important. 2. Whole boat then ups the rate (75-80+) and paddles as hard as humanly possible for 10 strokes. 3. Then rest for 120 seconds. I cannot emphasise this enough. The key to anaerobic-alactic conditioning is understanding that less is more! There will be times when you feel like you could do more repetitions or where you want to push yourself further.